Which is the Best Swimming Pool Enclosure – Tracked Or Trackless? 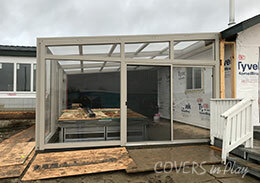 Currently, there are two main types of low profile pool enclosure on the market; the original tracked enclosures, and now more recently, the trackless enclosures. The product comparison is based on the following important criteria: Ease of use, Product performance, Aesthetics, Design and construction, Flexibility, and Price. Ease of use: Whilst both enclosure types are relatively effortless to operate, the Tracked enclosure has the edge in terms of how easy the enclosure is to open and close. The tracked enclosure requires only one person to open and close the enclosure, whereas the trackless enclosure ideally requires two people. This is to ensure the enclosure does not become misaligned by being pushed from one side only. Product performance: In terms of performance both enclosures are equally matched. They both offer great insulation properties due to the nature they are both low profile. This design feature also helps in terms of ease of use, and product maintenance. Pool Enclosures – Retractable Pool Enclosures – Fixed Enclosures Photos provides complete installation consulting and services for pool and patio enclosures wherever they might be. Aesthetics: There are two aspects to the overall aesthetics of the products. Firstly is the materials used, and the second is how high or obtrusive they are as structures. For buyers with aesthetics as a high priority, the Trackless enclosures tend to win here. These enclosures use the combination of the clear Plexiglas with double walled polycarbonate. Design and construction: Both these enclosure types are of a robust construction; however, the Tracked enclosures only need a lighter framework. This is because the tracks themselves are part of the overall construction, and the Modules are fixed to the tracks providing additional robustness and resilience to strong winds. Flexibility: In terms of flexibility there is no clear winner, as they both offer different aspects of flexibility. The Trackless enclosures have the benefit of doors at both ends for ease of access and can be telescoped either way on your pool. Also, they can be easily moved totally away from your pool in the summer to provide all-round access to your pool. However, the Tracked enclosures offer something different.